Investing in gold is a time-honored tradition and many investors world wide still own physical gold as a part of their investment portfolio. Of course, one doesn’t need to store physical gold in a treasure chest in the office to gain exposure to the gold price. Options, futures contracts, certificates, gold accounts, forwards and CFDs are just a few examples of products that will give you exposure to the gold price. You might also wish to look at gold-focused exchange-traded funds (gold ETFs), gold-focused exchange-traded notes (gold ETNs) and gold-focused exchange-traded closed-end funds (gold CEFs). Last but not least, investing directly in gold producing stock companies or in stock options for such companies is a way to gain exposure to the gold market. Below, we will take a look at three venues for investing in gold: gold accounts, gold certificates and storing your own physical gold. Some banks offer special gold accounts. If the gold is allocated, it means that it is fully reserved. If the gold is unallocated, it means that the gold is pooled. Before you deposit any gold into a gold account, it is very important to find out how strong your legal claim to the gold will be. Will the gold be stored separately in your own name? Is the bank simply a custodian of the gold, or will the gold appear on the bank’s balance sheet? If the bank faces asset forfeiture or bankruptcy, will your gold be lost? Once your gold has been deposited, will it be possible for you to create a bailment on allocated (non-fungible) gold? Gold certificates are issued by banks and also by various gold pool programs. The availability of gold certificates varies greatly between different countries. Gold certificates are for instance common in Switzerland and Germany. One of the reasons why investors opt for gold certificates instead of keeping physical gold is that they don’t want to pay for having the gold assayed if they need to sell it. As always, it is important to find out beforehand if the gold will be allocated (fully reserved) or unallocated (pooled). Allocated gold certificates are certificates issued for specific gold bullions, not just for any gold bullion. Unallocated gold certificates is the origin of our modern paper bills that we use as currency. As early as the 17th century, European goldsmiths would store gold for their customers and issue a certificate as proof of ownership. These certificate could then be used for trading instead of actual gold changing hands. You don’t have to go through an intermediary such as a bank when you want to access your gold. You, not the bank, are in control of the safety measures regarding the gold. No one else needs to know about your gold. It is easier for governments to force banks to disclose information about gold held for third parties than for governments to find out about all the individuals that are storing gold independently of banks and similar institutions. There are historical examples of governments trying to limit the individual’s right to own gold in times of economic and social turmoil. The US Government did for instance restrict private gold ownership in 1933 (as a reaction to the Great Depression) and didn’t reverse the restriction until 1975. The risk of having the gold stolen or damaged. If people know or suspect that you have gold, you may become of target of a home invasion. The costs associated with storing the gold in a safe way. Assayed gold that is taken out of the system will need to be re-assayed to be considered assayed gold when you want to sell it. Keeping physical gold is not an efficient choice if you want to engage in gold trading and make money from small gold-price variations. Bullion is precious metal (e.g. gold) in the form of bars, ingots or coins. The value of a bullion is typically determined by its purity and mass. Fire assay is a centuries old method for assessing the purity of gold bullion. Today, spectroscopic instrumentation can also be used. 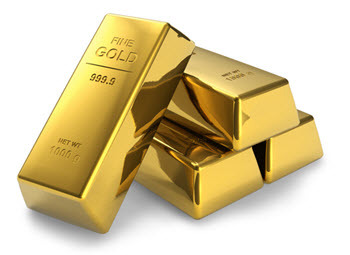 Examples of commonly occurring sizes for bullion gold bars are 12 kg, 1 kg, 100 grams, 10 grams, 1 Tael and 1 Tola. Bullion gold bars are typically less expensive than bullion gold coins even when the gold content is exactly the same. 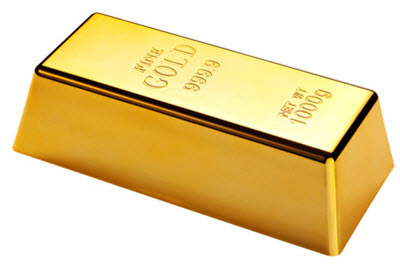 In countries such as Austria, Switzerland, Lichtenstein and Canada, major banks sell bullion gold bars to the public, making it easy even for small-scale hobby investors to purchase assayed bullion gold bars. Serious large-scale gold speculators typically work within the London Bullion Market (LBMA) system and only deal in Good Delivery bars. Bullion gold coins will typically cost you the market price for the gold they contain + a small premium based supply and demand for bullion gold coins. Numismatic gold coins sought by collectors can have a market price that vastly exceeds the value of their gold content. Contains 91.67% gold and 8.33% copper. The copper makes the coin stronger and gives it a reddish hue. There is approximately 46 million troy ounces of gold in circulation in the form of Krugerrand coins. Bullion gold coins held by investors are usually two ounce coins or smaller. The most popular variant is arguably the one-ounce bullion gold coin. Bullion gold coins are rarely 100% gold since that would make them very soft and sensible to wear and tear. Instead, other metals are added to form a stronger alloy. Gold rounds look like coins but are not legal tender and are not minted by governments. Their size and content vary greatly. Due to them not being guaranteed by any government, they tend to be somewhat cheaper than legal tender bullion gold coins.